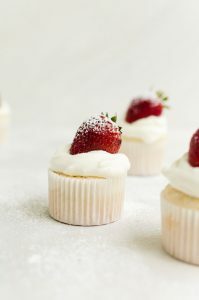 Light as air angel food cupcakes are exactly what you need to satisfy that sweet tooth without feeling weighed down. 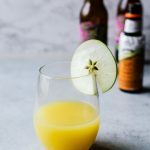 Pair with your favorite Middle Sister wine for a sweet and sassy summer treat! It feels like it’s been a while since I’ve shared a cupcake. I feel like there are never enough cupcakes around. Every time I make a batch, I find myself wanting more. This is especially true when it comes to these angel food cupcakes. 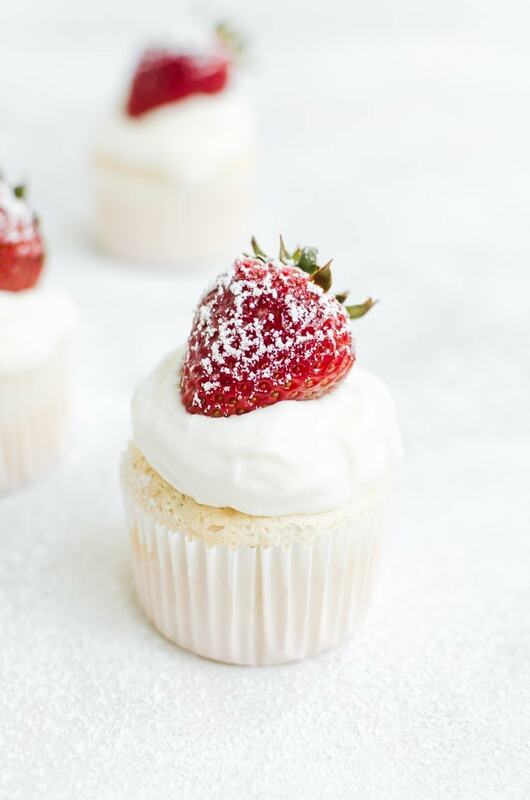 These tasty little cupcakes are seriously so light and are almost like you are eating a cloud. Angel food cakes have a reputation for being difficult to make, but I can assure you, that is not the case with these cupcake versions. 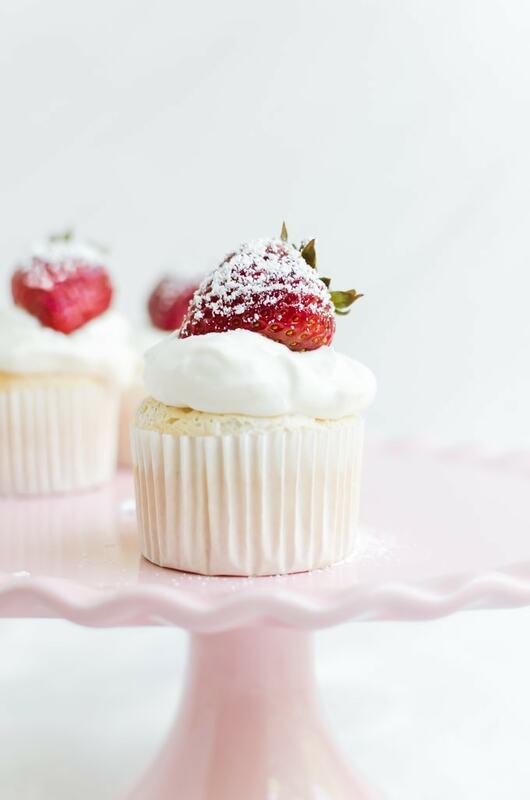 Angel food cupcakes are totally drama-free, just like how I like my summer get-togethers and my wine. 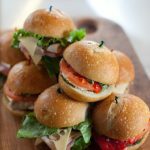 Just like hosting the perfect outdoor summer party, they just need a bit of careful planning and a delicate touch. And of course, the perfect wine pairing. 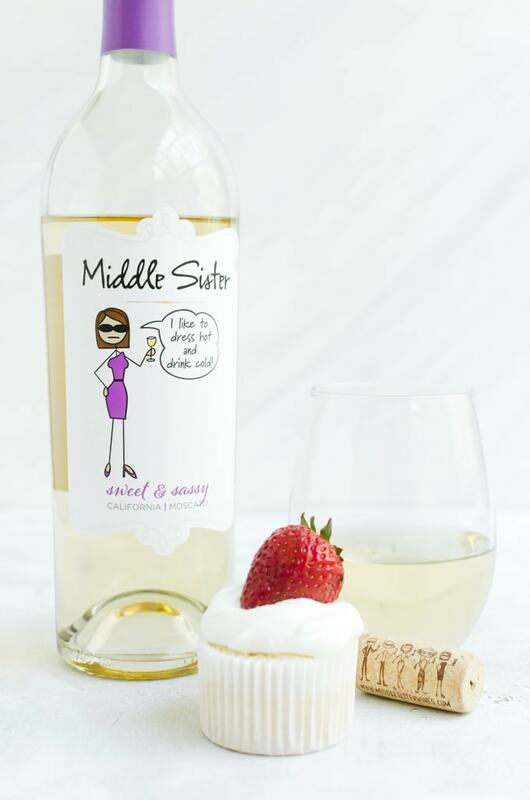 Personally, I love to have mine with the Sweet & Sassy Middle Sister Moscato, but they pair well with their Pinot Grigio and even their Pinot Noir, if you swap the strawberries for a darker berry like blackberries. 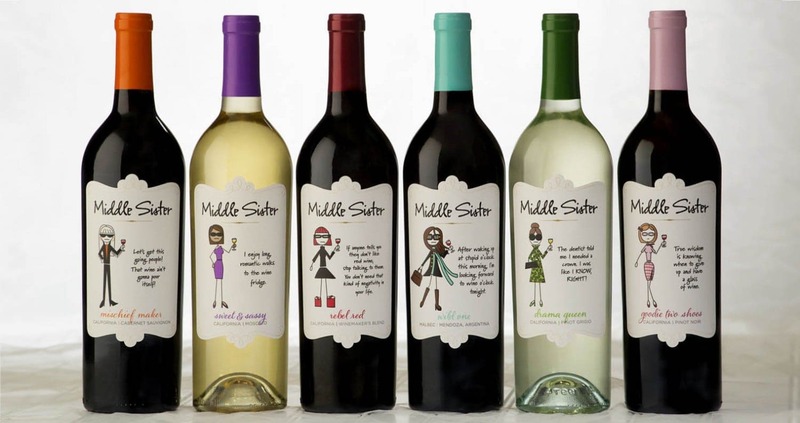 Middle Sister wines were created about 10 years ago by the founding women of the Wine Sisterhood. Founder, Terry Wheatley, was completely fascinated by her friend’s middle daughter. From childhood, she was simply captivating in all ways. Terry created Middle Sister wines for middle sisters everywhere, giving them the attention they deserve. To celebrate their 10th anniversary this year they are hosting a monthly Kate Spade purse sweepstakes. Be sure to enter to win this month’s Middle Sister giveaway and remember to bring your favorite Middle Sister character along to all of your celebrations this year. 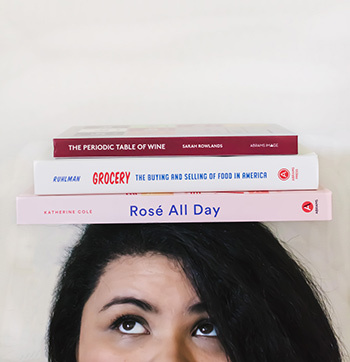 Wines are available in stores across the U.S. and online, check their store locator for exact locations. 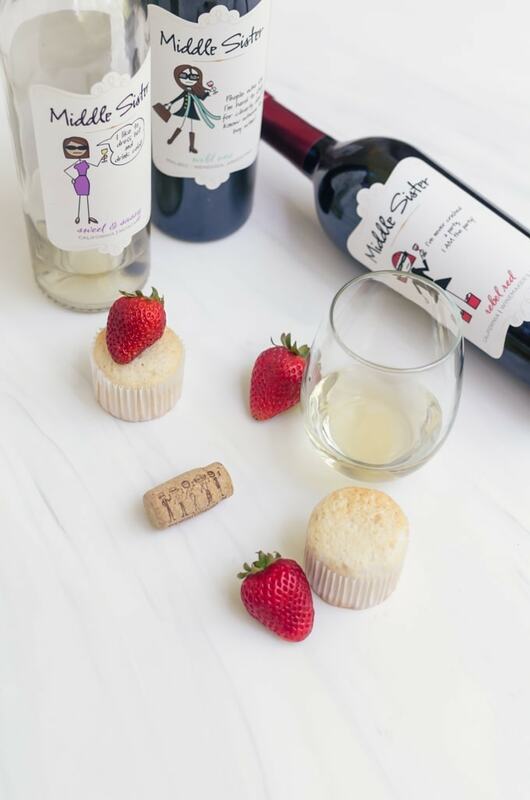 I love to give my angel food cupcakes a little twist to match with the Middle Sister wine I am pairing it with. For these particular versions with the moscato, I added a touch of raspberry extract and some lemon zest. 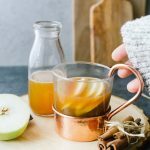 You can try using only lemon or raspberry. If you want them more traditional, you can also go with just vanilla! For a truly fun twist that pairs well with their red wines, you can substitute half of the flour with cocoa powder! Or mix things up and offer a variety. No one would be able to turn them down at a get-together when they pair it with their favorite Middle Sister wine. Light as air, these angel food cupcakes are truly hard to resist. Preheat the oven to 350 degrees F. Line a cupcake tin with cupcake liners (You can also make them without the liners and very lightly grease and flour the tins, but I find they are easier to make and less likely to deflate when you use liners. In a medium bowl, mix together the flour, 1/2 cup of the powdered sugar, and salt. Mix until combined and set aside. In a freshly cleaned and dried mixer, add the egg whites and beat until frothy. Add the cream of tartar and continue to beat until the egg whites form soft peaks. Slowly begin to beat in the granulated sugar. Continue to beat the egg whites until they form stiff peaks that are nice and glossy. Beat in the vanilla as well as the lemon and raspberry if using. Pour the flour mixture into the beaten egg whites. Gently fold in the flour until it is incorporated. Do this by hand and occasionally scrape the bottoms and sides of the bowl. Your goal is to fully add in the flour without deflating the air in the whites. The volume of the mixture will go down slightly and the mixture will turn slightly runny. This is normal, but it should not become watery, if that happens, it is overmixed. Evenly divide the batter into your cupcake tin and bake for about 14 - 16 minutes, or until the cupcakes are risen and are slightly golden brown at the edges. They should feel a bit bouncy when you touch them, but do not press down too much. Remove from the oven and carefully remove from the tin. Handle with a light touch as they are still hot and rough handling can still slightly deflate the cupcakes. Set aside to cool. While the cupcakes are cooling, beat the heavy cream and the remaining powdered sugar. Dollop on top of the cupcakes and then finish with seasonal fruit. I might dare to say that I’ve never seen more perfect cupcakes. I mean i’m really not a cupcake person but you seriously have me considering pulling out the mixer at darn near midnight. Props lol! Hey! Love love love the look of these! What kind of cupcake tin do you have? Oh I’m not sure, it is just one I got from A.C. Moore… maybe it’s Wilton!